Global bin weighing company BOTEK has remained ahead of the curve in legal for trade weighing for nearly four decades. As waste collection is often collected based on volume, what the customer throws in the bin directly impacts the profitability of the waste contractor. However, a contemporary approach known as weight-based billing provides real-time data on the billing of waste management services for front and rear loaded bins in the commercial and industrial sector. The idea behind this method is to incentivise recycling and discourage landfill through clearer price signals with accurate measurements of waste. The National Measurement Institute (NMI) is responsible for approving weight-based billing technologies, and under its regulations, if using equipment such as a weighing instrument to determine how much to charge a client, it needs to be approved by a licensed technician. Paying by weight means the user is the one who will end up paying – a stark contrast to traditional methods of individual contracts based on bin size, how often the bin is emptied and the specific waste. As a result, those who recycle or reduce their waste could end up paying far less for their disposal. Phil Carthew, Managing Director of manufacturer and supplier E-Max Australia, says individual bin weighing to analyse the waste stream of customers isn’t always a profitable solution. BOTEK has worked in partnership E-Max for the past five years in Australia, supplying them with legal for trade solutions. Phil says BOTEK is one of the only providers that offer a complete streamline package. The company provides NMI-approved weighing systems for all side and rear lift trucks, including a recent application with the NMI for front lift trucks. Phil says once the application is successful, E-Max will offer the most accurate and robust system on the market. 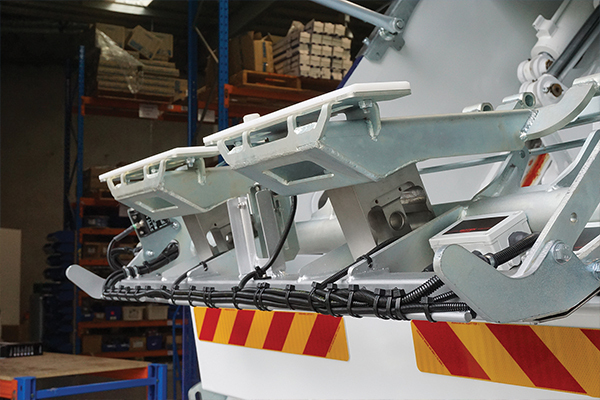 Dynamic bin weighing, such as weight-based billing, comes with a host of challenges that first need to be overcome and integrating all the necessary equipment is vital. BOTEK’s radio-frequency identification devices (RFIDs) are able to capture a significant amount of real-time data and help to ensure there is accurate bin-to-customer identification, which makes the system more efficient. BOTEK has released its Evolution tool to plan, optimise, execute and report collection work. It does so through dynamic bin weighing and automatic collection registration. Each collection of a bin or container is automatically registered by the refuse collection vehicle and reported in real time with location and time of pickup, noting any possible deviations. The system uses quality-assured collection work to bring about higher quality and precise administration and customer service. Evolution tracks customers, containers, vehicles and drivers, aiming to do so in a simple and comprehensive manner. In addition to tools for route planning and optimisation, it allows users to follow the collection work to get an overview of all vehicle routes with an estimated time of arrival. The system also allows users to quickly move containers between routes or coordinate between several vehicles. Phil says route management in Evolution is dynamic and simple to manage. For example, if there are frequent changes in the collection day for a container, all routes affected by this are updated automatically, even if the route is already planned and dispatched to one or more vehicles. All collections, even outside the route, are recorded and shared via the server so the collection status is updated in vehicles that have the container on their route. This makes it easy to plan for the office and for drivers to share routes and information during the collection process. The Chain of Responsibility laws, which are undergoing changes in mid-2018, mean that if you consign, pack, load or receive goods as part of your business, you could be held legally liable for breaches of the National Heavy Vehicle National Law – even if you have no direct role in driving or operating a heavy vehicle. This has had a top down effect on waste and how it is transported, says Phil, with directors, senior managers, supervisors, drivers and customers who overload bins and trucks only a part of the picture. “The landscape of the transport industry will change as of mid 2018. The trick will also be understanding what weighing equipment will aid loading and axle group mass compliance, as opposed to weighing the content of a bin on either a rear, side or front load vehicle,” Phil says.